You ever have a situation where you find out about some new treasure only to realize that it's only new to you, but well known and prized by others for a long time? 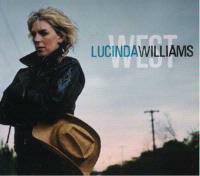 Well, such is my discovery of Lucinda Williams. Here I am listening to this great new artist. Then what do I find out? Her first album was released in 1979. And she's been pretty steadily putting out discs ever since. Well, I guess I've got some catching up to do because this lady's music is both unique and infectious. It's not quite like anything you've heard beyond her music, but yet it grabs on and holds you. While the particular combination of sounds and textures found on the disc are all her own, there are some comparisons that can be made. In terms of vocal performance you might think of some sort of conglomerate of Bonnie Raitt, Patti Smith, Marianne Faithful and Hope Sandoval. While that list will get you close in terms of the singing, the music is even harder to pin down. In terms of songwriting one might think of Bob Dylan, the aforementioned Patti Smith and others. The musical performance, though is all over the map. With everything from Mazzy Star like slow moving gloomy psychedelia to straight ahead folk, country and a lot more. One song even has a couple sections that feel a bit like Hawkwind, Pink Floyd and King Crimson. Yet everything is cohesive and addictive. This may be my first exposure to Lucinda Williams, but it sure won't be the last. The sound on this opener calls to mind a mix of folk rock, country and alternative music by groups like Mazzy Star. With a rather warbly psychedelically tinged arrangement, I like this a lot and couldn't imagine a better opener for the disc. While I don't like this track as much as the last one it has its charms. To the casual listener it might seem to inhabit much the same musical territory as the last number, but it truly is a lot different. Gone are the country and psychedelic tones. What we are left with a slightly bluesy folk rock song. It's a good one, but just not up to the quality of the tunes that surround it. A bit twangy, but with a definite blues texture, this is another strong one, and a step up from the track that preceded it. It's catchy and evocative. Slow acoustic folk tones with earthy country vocals makes up the mode of this slice of Americana. While it's not really up my alley, I can appreciate the art and vision that goes into it. When it powers up later with the addition of other instruments and more volume it takes a turn for the better. This isn't that bad, just not as good as some of the rest of the stuff here. The instrumental break is a good one, though. Coming in with a hard rocking sound, this one is a major change of pace. It has a much more electrified sound, while still maintaining a bluesy and slow motif. This is one of my favorite tracks on show here mostly because of its powerful vocal performance. The great instrumental arrangement with its nearly prog rock take at times doesn't hurt, though. This one rocks out pretty hard in the late sections. The subtle and gentle tones of this track come in stark contrast to the crunchy power that preceded it. This is a bare bones acoustic ballad with twinges of country and folk music. Here we are brought back into electric territory with this hard rocking jam. Still possessing a little bit of a country texture the transition from the previous cut to this one is probably similar to the effect felt by people witnessing Dylan's transition from acoustic to electric sounds. It reminds me a bit of Marianne Faithful. This is another of my favorites on the disc. Be advised of a parental advisory on the lyrics. Also be on the lookout for a smoking guitar solo. This is one of the more fully arranged cuts on the CD with an arrangement that combines the sounds of alt rock like Camper Van Beethoven with the folk/country based mellow rock that makes up much of the rest of the album. The instrumental break mid-song has some great nearly classical textures serving to bring an almost prog rock atmosphere into play. This is another highlight of the disc with a great emotional character to it and some wonderful tones and moods. A dramatic folk sort of arrangement turns up as the motif for this song. This is another of my favorite cuts on show here, coming across with some awesome textures. Once more classical type strings are added to the mix for great effect. This is another powerful piece of music. A slow paced country folk grind with more of those Mazzy Star elements makes up the main crux of this piece of music. In fact, this one reminds me more of that outfit than the opening piece did. It's another standout. At over nine minutes this is the longest track on show here by a long shot. It starts with ambient tones and Williams sounding like she's on the phone, “yeah,” “mmm hmmm,” etc. After this goes away a percussive texture takes over and Williams eventually lays her bluesy vocal line over the top. With other instrumentation coming in gradually this reminds me just of a lot of modern blues. With Williams putting forth a spoken rap type vocal later I'm reminded of Marianne Faithful again – and perhaps Patti Smith. This becomes more of powered up bluesy grind as it continues, but still the quirky sort of approach with the rapped vocals carries on. This turns a bit spacey at times and is a killer groove. The varied approach here is just so cool. It turns into a noisy exploration of space that calls to mind Hawkwind and Pink Floyd for a time later. There is even some King Crimson like noisy dissonance as this keeps on reinventing. This may be my favorite track on the disc, despite (or maybe because of) the unusual nature. A total change from the last track, this comes in as a pretty acoustic ballad. The folk modes dominate here, feeling a bit like a female version of Bob Dylan. Here we have another slow moving cut with plenty of country and folk textures. This isn't one of the standouts on the disc, but the evocative power of the track and earthy beauty makes it a great choice to close out the disc in a satisfying way, bringing it down in style.